I originally thought I would do a very long post with a lot of progress shots that I took while making my Raiders painting. Then I figured it would just be easier to put it all in a short video. The video will only appear here. Enjoy! 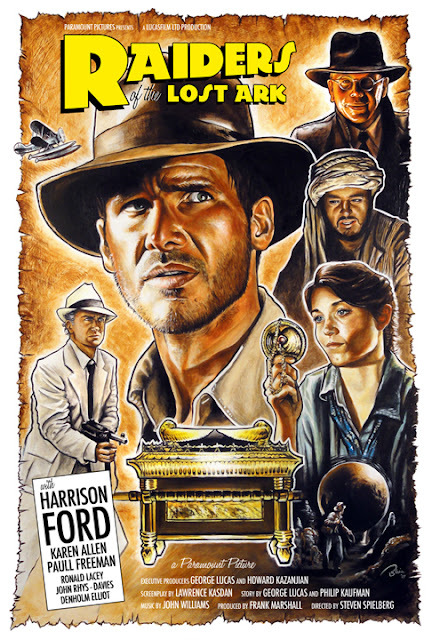 I finally finished my Raiders of the Lost Ark painting last Thursday! After I finished the painting I took photos then added text via Illustrator and Photoshop to give it that vintage serial movie poster feel. It made it's debut Friday over at Planet-Pulp. Very soon, I'll do another post with progress shots. It feels really good to finish it and I'm extremely happy with the way it turned out.